When it came to health issues, the Utah Legislature took some big steps over the 45-day session, capped with its passage of a Medicaid expansion that could extend insurance coverage to more than 70,000 low-income adults. Lawmakers also approved bills addressing public health crises that are killing hundreds of Utahns each year: opioids and suicide. And they granted the terminally ill an option for using marijuana, while pushing for more controls on the state’s abortion protocols. Yet on two fronts — the partial Medicaid expansion and medical marijuana — they refused to go as far as a majority of voters want. It might not matter: Both the questions of a wider Medicaid expansion and legalizing medical marijuana are on track to land on the November ballot, allowing Utahns to potentially change those laws themselves. The Legislature approved what amounts to a large — but still only partial — expansion of Medicaid coverage for the state’s neediest residents. Lawmakers have consistently refused to cover the state’s “gap” population of about 150,000 uninsured poor people, who were supposed to gain Medicaid coverage under the passage of the Affordable Care Act (ACA), or Obamacare, eight years ago. For several years, Republican legislators have voiced concerns over the program’s potential costs, despite the federal government paying 90 percent of the bill. But that stance changed this session, after the Trump administration said it would agree to several changes Utah wants to make to its Medicaid program. Those include work requirements as a condition for Medicaid coverage; caps on enrollment spending; and a provision that would automatically sunset the program if the feds try to pay anything less than 90 percent of costs. One big question mark looms, though. Utah only wants to expand coverage to residents making up to 100 percent of the federal poverty line, not up to 138 percent as the ACA required. Experts say the feds might not go for that idea. Indeed, officials with the federal Centers for Medicaid and Medicare Services have so far declined to approve a similar request from Arkansas. If the Medicaid ballot initiative passed, it would give coverage to all 150,000 people in the gap, and — unlike the Legislature’s version — it will not require special approval from the federal government. Two-thirds of of Utah voters support the initiative, several recent polls have found. In January, Gov. Gary Herbert announced the creation of a youth suicide task force after another near-record year of deaths. The group issued recommendations last month, and legislators responded with several bills aimed at tackling the issue. One bill expands the number of mental-health crisis response teams around Utah; directs schools to put in place youth suicide prevention and education programs; and allows the Utah Office of the Medical Examiner to collect more data on suicide deaths. Another measure raised spending to ensure the state’s crisis lines are properly staffed and never go to voicemail — a problem that has cropped up in the past. A third measure orders state officials to seek federal Medicaid funding to improve some of the state’s mental-health programs. Lawmakers declined to pass a bill requiring all Utah doctors to regularly attend suicide prevention training to better spot potentially suicidal patients early on. The bill drew opposition from medical groups amid worries it would add to physicians’ already heavy training requirements. To address Utah’s prescription opioid epidemic — which killed nearly 400 Utahns in 2016 — lawmakers passed a bill requiring pharmacists to place labels on pill containers, warning of the risk of overdoses and addiction. The measure also requires the Utah Department of Health to create and distribute a pamphlet with information about addiction and the overdose dangers of opioids. Another bill will require additional checks by doctors of a state prescription database to gauge if their patients may be at risk of addiction. The same legislation gives state regulators authority to review the database to identify physicians who may be over-prescribing. 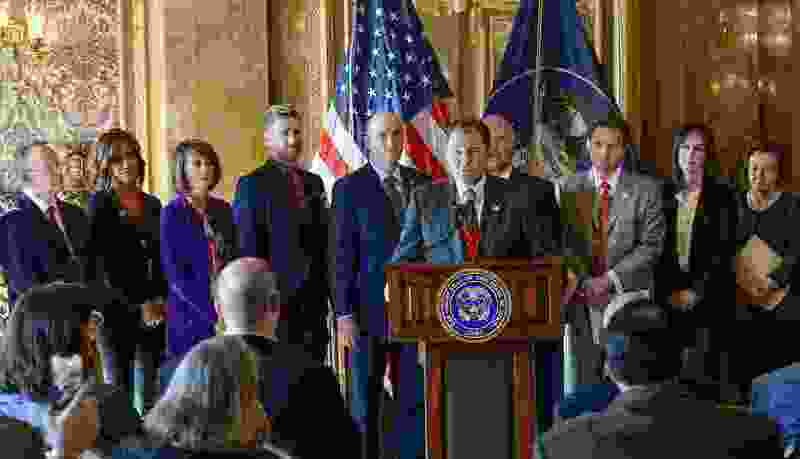 Lawmakers passed a resolution calling on Utah Attorney General Sean Reyes to sue large opioid manufacturers — a step several counties in Utah and around the country have already taken, along with at least 16 states. The resolution followed House Speaker Greg Hughes’ “call to arms” declaring war on Big Pharma opioid makers on the first day of the session. A bill to criminalize doctors who perform an abortion in light of a Down syndrome diagnosis was among the most hotly contested bills of the session. But after clearing the House and a Senate committee, the measure was never heard on the Senate floor in the closing days. Rep. Karianne Lisonbee, R-Clearfield, said she was frustrated that her colleagues opted to effectively “bury” her bill, which was backed by anti-abortion groups and parents of children with Down syndrome. The biggest challenge? Legal experts and even the Legislature’s own legal counsel labeled the bill as most likely unconstitutional. Meanwhile, an abortion bill that did pass requires women to complete an “information module” discouraging the procedure, delivered via an electronic tablet. It replaces the state’s current abortion education materials, which include a scripted statement, a brochure and a 1980s-era video on the Utah Department of Health website. Legislators approved two bills designed to give the terminally ill access to marijuana when they are deemed by doctors to have six months or less to live. One allows access to the drug for patients; the other allows the state to contract with a marijuana grower. A third bill sets a legal framework for businesses to sell cannabidiol, or CBD — a cannabis compound without the psychoactive ingredients. Those probably won’t be significant enough to appease a majority of Utahns who favor wider marijuana access. A recent poll found 76 percent support a proposed ballot initiative that would legalize marijuana for a variety of medical reasons. Even Herbert earlier this year acknowledged voters were likely to legalize medicinal use of the drug at the polls.